Time to take a look at cruising from a perspective different from my own. For some years I have been trying to persuade my son to join me on a ship. He finally agreed to travel with me on Carnival Sunshine. I don’t know what persuaded him. It may have been Carnival’s Switch On Fun which aired on British television earlier this year. It may, knowing him, have been a morbid fascination with the Carnival brand. In any case, his preconceptions appear to have been influenced more by a 1997 literary essay rather than my blandishments. And I did have to keep reminding him we were travelling on a ship, not a boat. It was hard not to have that essay in mind when I arrived in Barcelona to board the Carnival Sunshine. As it turns out, Carnival are all about fun. Their advertising slogan is ‘Switch on Fun’, they run a ‘Faster to the Fun’ programme to ‘maximise vacation fun’, and their shipboard daily newsletter is called the ‘Fun Times’. I went into the experience more or less blind. I knew where we’d be sailing around Italy, but that was about it. Partly this was intentional; rather than risk prejudicing myself, I wanted to be in a position to judge the trip and the ship on their own merits. Not that the BBC made it easy by starting a series reinforcing some of the worst stereotypes a couple of weeks before we left. But I digress. It wasn’t long before the stereotypes were busted. On boarding Carnival Sunshine it was clear that the average cruise passenger was a lot younger than I’d expected. Rather than aged folk enjoying their retirement, there were a lot of young families and couples. Those north of 60 appeared to be the exception rather than the rule. Initially the ship seemed huge, with a towering atrium and bars and shops and other venues scattered everywhere. It wasn’t long before I knew where everything was, and what the quickest routes between any points A and B were. After that it felt a lot smaller. After the first two days I spent a lot less time on the ship, being out on excursions every day. First Pisa, then Rome, followed by Pompeii, and capped with a trip up Mt Etna. 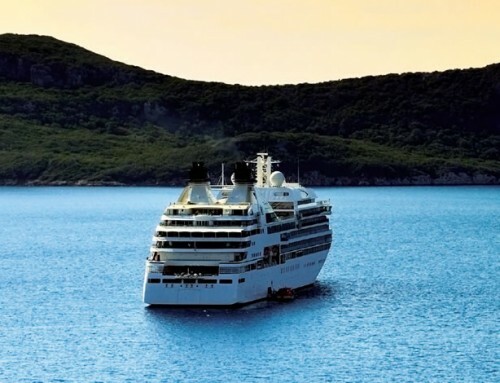 One of the big advantages of cruising is apparent from that list – you get to see a lot of places in a few days. But we’ll deal with the ports of call in a later post. For now, I’ll stick with the ship. After Etna we had a ‘Fun Day at Sea’ (the ‘Fun’ word again!). This was to be the only such day on our cruise, which was a surprise. I’d thought cruise ships spent more days at sea than that (it later occurred to me that I must have formed this impression from watching classic Hollywood films where the characters are taking a Transatlantic crossing). For me, a fun day at sea could more accurately be called a relaxing day at sea, as my body tried to catch up on all the sleep it had been missing. A lie-in was followed by brunch, then a nap, following which I stirred myself into action for a walk around deck. It could get pretty packed. Children were making good use of the Waterworks and the SkyCourse. The former a water park with speed slides and a play area, the latter a rope course suspended above the deck. Again the sheer number of children having fun more than shattered my expectations of the average passenger. More sedately, loungers on both sides of the deck were littered with people sunbathing and reading. Above the front of the ship was the three-deck Serenity area (which also incorporated the spa and gym inside, though I didn’t venture that far). Dominated by a waterfall feature, this area is intended for quiet relaxation. Though supposedly for adults only, I did notice what seemed to be more than a few young teenagers present with their parents. Seats in Serenity (and, indeed, the rest of the deck) aren’t supposed to be ‘reserved’ by leaving towels or books on them, yet I noticed plenty of otherwise unoccupied seats. This was frustrating and ultimately led to me leaving Serenity to find somewhere else to sit. Signs around the deck advertise the fact that ‘reserved’ seats are supposed to be tagged by staff and cleared after 40 minutes, but I’m not convinced as to how strictly this was enforced as I saw no evidence of it happening. Below decks, Carnival Sunshine has a number of food and drinks venues, some are open all day while others have set hours, and the Pizzeria del Capitano is open 24/7. At the rear of the ship is the Havana Bar, which as the name implies is a bar in the evening. Few seemed to realise that during the day it is available as overflow seating for the Lido Marketplace buffet, while the speciality restaurants to either side also served as omelette stations for breakfast. Lunchtimes saw them serving pasta and Mongolian Wok stir-fries. What started off being a quiet place to have breakfast soon caught on, however, and it ended up being packed the last few days. The themed bars I found a bit hit-and-miss. The Library Bar, a quieter area where people could sit and read, work, or play games, was a hit for me (full disclosure: for my day job I work in a library); the Red Frog Bar, while being a bit incongruous in theme, as a Caribbean bar in the middle of the Med, was always pleasurable. The highlight for many was surely the Piano Bar, which was always, always busy in the late evening as people stopped in and stayed to be entertained by pianist Billy. Before I experienced it for myself I thought it seemed unusual to make the piano player the focal point of the room, rather than just a provider of background music. On this occasion, because they had the right person playing the piano, it really worked. Top of the misses, on the other hand, was the EA Sports Bar, which had a bafflingly large bar counter that stole valuable space from the room while leaving bar staff a huge expanse to stretch over when reaching for empties. The room’s TVs did provide an amusing moment, however. Showing the cricket on one of their big screens (really four screens stitched together), one of the screen splits was in just the right place to make ‘Run rate’ look like ‘Fun rate’, which seemed quite appropriate. Alchemy was both a hit and a miss. Its elaborate cocktail drinks (accompanied by their backlit menu) were hits for sure, but the location was a big miss. Rather than having a space of its own, it was in a corner at the end of a corridor, which did nothing for the ambience. Now on to an area some people find one of the most important aspects of cruising – the dining. It had been my impression that dining on cruise ships was always done at set times and in formal attire. To the surprise of no-one (except me), that of course wasn’t the case. On the Carnival Sunshine, even on the “cruise elegant” evenings (as Carnival calls their formal nights) the dress code wasn’t strictly enforced, though most passengers did step up to the plate and get into the spirit of it. We were served by an excellent team in the Sunset dining room, although I could have done without the moment every night when the entire restaurant went into a song-and-dance routine. That’s rather too much fun for me, I’m afraid. The table behind us enjoyed it immensely, though. Carnival Sunshine also offers a number of speciality restaurants which charge extra. Of these, I dined at the Fahrenheit 555 steakhouse first. The dining area was compact and stylish without being cramped, and the steaks were a match for many mainland steak restaurants; I did feel there could’ve been a little more variety in the sides available, but that’s a minor quibble. I also dined at JiJi Asian Kitchen, which at $12 a head is astoundingly good value. Its pan-Asian menu was slightly complicated, as apparently you’re supposed to order dishes across your table as a whole rather than individually, but luckily I wasn’t the one tasked with putting it all together. The kung pao chicken was hot and spicy, even without adding any chilies to a mouthful, while the slow-braised beef short rib was the highlight of the lot, even if it was the one item where I had to admit defeat with the chopsticks and use a fork to transfer it to my plate. Sunshine is so far the only Carnival ship to have a JiJi’s. It’s fair to say if they don’t start rolling it out to their other ships, they’re missing a big opportunity. By the time I arrived in Venice it was something of a surprise to consider only nine days had passed. Could it really be that so many experiences had been crammed into such a short space of time? Even taking into account the fact I abandoned exploring Venice after having taken in St Mark’s Square and the Rialto because it was too hot, I had still managed to do a lot. The final meal the last night in Venice was strange – how was it I could look out the windows and not see anything moving? There was one thing I couldn’t get used to during my time on board. Going to bed at night was one thing, but every morning I’d be woken by the ship’s movements as it docked, before falling back asleep again. Ideally I’d have it so the ship never docked before I woke up, but I doubt many others on board would’ve been happy with that. One highlight each evening was to return to the cabin and find a towel animal sitting (sometimes reclining) on the end of the bed. This, Captain Greybeard informed me, was another fun thing Carnival always did. I was fascinated to see what we would end up with each night. The good Captain, on the other hand, was disappointed we didn’t get a monkey hanging from the curtain rail. Thanks Nick. I have a sneaking feeling you really did find cruising is fun and you’ll be back at sea before long. There’s that short P&O cruise to Bruges and Amsterdam we were looking at, and I’m pretty sure I could persuade you to sample a cruise on one of Norwegian’s big new ships. They have even more speciality restaurants and some spectacular entertainment. Which reminds me . . . you haven’t mentioned Sunshine’s shows. More to come with your thoughts from the ports of call?